Over 17 years very good security and copy protection software. We understand that illegal copies are a problem so we give you our best. More profit with less illegal copies. You can order our "All in one bundle" for a very low price. We have clients around the world. You can test our demo versions for free. WTM CD Protect - Protect your CD against illegal copy. More profit with less illegal copies. Create your own copy protection for your music, video, photo, image or data cds. This copy protection system is easy to use and have a strong copyright protection. Worried about CD duplication, illegal copies? What you need is CD Protection – software that makes sure the data on the CD cannot be copied onto another. Effective CD protection (for Music CDs, Video CDs, Data CDs, Games, EBooks, other books, photos and images) and CD copy protection is what you require to leverage your business, give it that cutting edge and of course, increase your profits. You have a requirement and we have the solution! What you need is the WTM CD Protect for your business for home. USB Flash Drive Copy Protection tool provides one of the best USB security solutions which helps end-users have complete control over copy protection. Thus, users get complete and efficient digital management. USB Flash Drive Copy Protection is used for encrypting all types of data (electronic documents), namely pdf, doc, xls, txt, flv, tutorials, pps, rtf, psd, xml, guide, exe, mpeg, mpg, swf, pdf, html, drm, mp3, scr and so on. 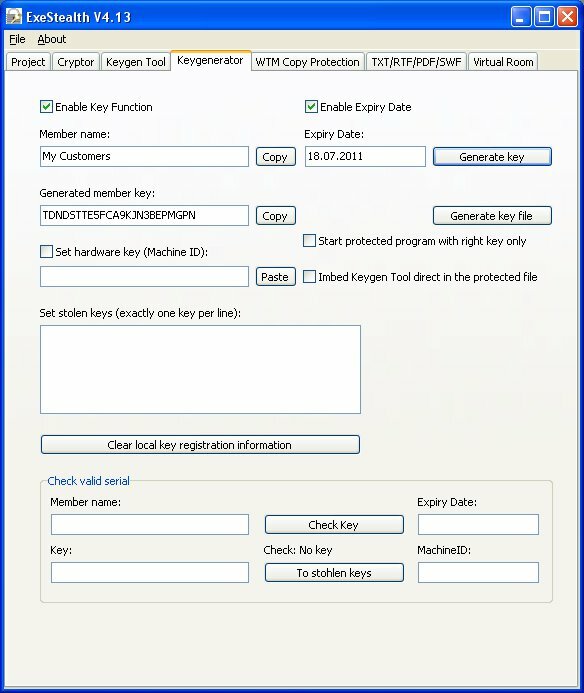 WTM crypts all data from the source folder to USB using the finger print generated and writes this directly to the USB flash drive. DVD File Protection provides an enhanced and efficient layer of protection and complication to your DVDs which avoids and removes the effect of hacking, cracking and ripping tools. The File Protection tool (for CDs, DVDs, BDs, USB Dongle and USB Flash Drives) is updated to meet the current changing needs of the market. The DVD File Protection tool also helps to protect the integrity of your digital content with the compatibility also being maintained. Lock your data with this locker. Try WTM CD Protect today for free ! Stealth protector is the one stop solution for all your protection requirements. Executable files are susceptible to hackers and code crackers. You need to ensure that your work stays safe, secure and uncorrupted. We will give you Anti Cracking Protection, a full Software Licensing System, Engine to suit your needs, a good Engine, Bundling of whole Applications in a Unique Layer, Evaluation, Trial, Code and Resource Compression which is compatible with several development tools. Perfekt for software programmer, photographer, small film studios, developer, coder, tester, programming, animation creators and for coding. Most importantly, protect your applications against cracking and copying with our Stealth Protector! 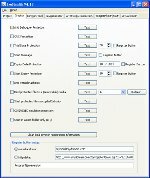 EXE Bundle - This EXE Tool is bundled with numerous benefits for its application users. A key feature is that the EXEBundle performs as a file joiner and helps join various applications and consolidate them into one file. This benefit offered by EXEBundle plays a key role for installers or embedded drivers. This is because it acts as a file splitter for your joined files done using EXEBundle and it is just enough to start only one file. The rest of the application files get started automatically in the background from the embedded files. 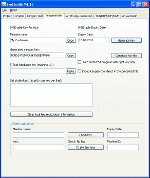 Thus, EXEBundle acts as one source for a file joiner (exe binder), protector and compressor, thus making the tasks of its application users easy and highly effective. Bundle your applications in one application. Bundle and protect files with a serial. WTM Register Maker is easy to use. Protect your software with serial numbers and with Software Licensing System for Software Development. 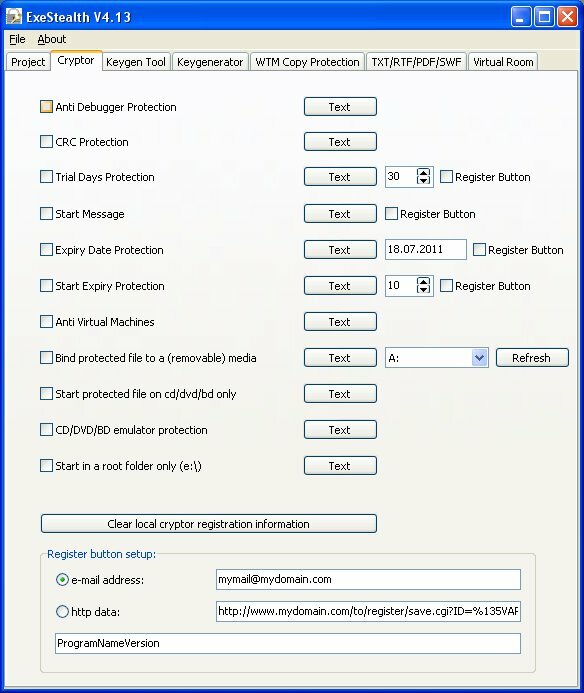 This program allows you to protect important files with cryptographic protection. 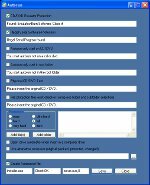 The WTM Register Maker is a Software Licensing System, a protection software for your business. It is user friendly, fast and extremely easy to load. This software licensing system provides strong protection for your registered .exe files with the help of serial numbers. You can only access the files if you have the complete serial number. No serial, no access! WTM uses state-of-the-art crypto technology to protect your .exe files against cracking. Order WTM Register Maker as your software security solution now! Scan the web with this Crawler by Hanspeter Imp - This is an automatic robot for websites with an own script language. Search web content with auto filler and clicker. For webmaster, managers, reseller, news and other peoples. 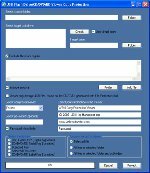 Add url to with this online website crawler tool. Try this online Crawler tool 2 today! Unauthorized copying of images causes trouble to various businesses. The only way to prevent illegal copies of pictures and images from getting downloaded is to protect the images using our WTM digital photo protection tool. The pictures are formatted by the tool using known methods and only customers are handled keys to the pictures. Any unauthorized access is prevented using various other methods to enhance business profits without affecting the clients. Piracy and data theft is rampant in the internet world in which hackers are able to download almost any information they want from the internet. The best way to ensure data protection is to make sure that digital rights are saved. Any place where the picture is saved should prevent unauthorized access to files and this is made possible using passwords for opening and saving files. Watermarks can be added to existing digital images to prevent anyone from claiming digital rights to the picture. Many websites are selling pictures and images and downloading pictures for sale must be prevented. Using WTM picture protection it is possible to let the user view the pictures without downloading it. After the user pays for the picture and utilizes shopping cart to complete the transaction, the picture will be available for download. Once your client buys photos, they will be available for complete customization as the limitations on the photos can be easily waived by sharing passwords and formatting methods of photos. The clients can then save their pictures in CDs, DVDs, USBs or any other storage media of their choice. WTM CD Protect - Protect your CD against illegal copy. WTM Software Distribution - Make your software better known. Want to promote your software? Try the WTM Software Distribution service and watch your profits go skyrocketing! With our distribution software service, your work travels to software archives around the world. WTM Software Distribution will then submit your software to software download archives automatically. It submits your software to more than 200 software archives online (with new ones being added to our list). You can use this service as many times as required on the new versions to get downloads. It is an automated system that works independently. Try the WTM software distribution system today!